Winmau’s Australian ace Simon Whitlock is in the hunt to become the sixth different winner on this year’s World Series of Darts events. Whitlock is targeting the inaugural Brisbane Darts Masters from August 17th-19th. Whitlock was progressed to the Semi-finals in the Auckland Darts Masters before narrowly losing out to World number one Michael van Gerwen in the quarters at the Melbourne Darts Masters. Whitlock lead MvG 8-4 during that match and also smashed in a sensational 170 finish before van Gerwen staged a sensational comeback. The sport’s most successful Australian now believes that it’s just a matter of time before he adds another title to his collection. "All that^s missing is it all coming together over one weekend. If that happens in Brisbane I can win the title without doubt." The Wizard of Oz stated in an interview earlier in the week. 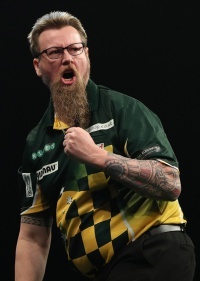 Whitlock is once again drawn against fellow Australian Corey Cadby in the opening round of the 2018 Brisbane Darts Masters. Action begins at 7pm local time on Friday 17th August and is broadcast live through Fox Sports and PDC TV for international viewers outside of the UK. Delayed coverage of the tournament will be broadcast at 7pm for UK viewers on ITV4 each night.